Kendriya Vidyalayas Chennai Recruitment 2018 2019 Application Form for Trained Graduate Teachers (TGT), Post Graduate Teachers (PGT) Posts Download Application through Official website www.kvdgqachennai.tn.nic.in. Kendriya Vidyalayas Chennai TGT, PGT Jobs Notification 2018 Released. The Interested Candidates are requested to Download Application through Official website. 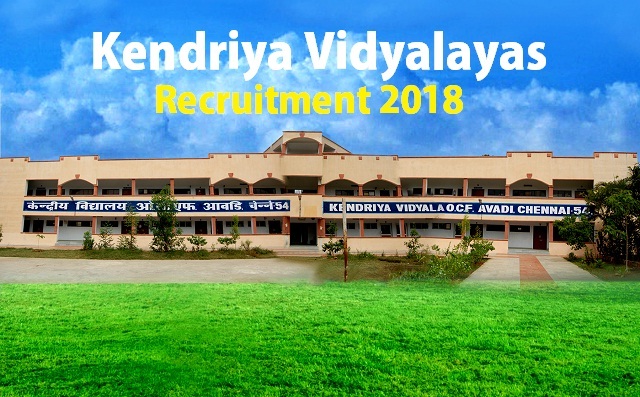 Kendriya Vidyalayas Chennai Walk-in Recruitment 2018 on Feb 27th. I TGT (Hindi) - Hindi as a subject in all the three years. 2 TGT (English) - English as a subject in all the three years. 3 TGT (Sanskrit) - Sanskrit as a subject in all the three years. 4 TGT(S.St) - Any two of the following: History, Geography, Economics and Pol. Science of which one must be either History or Geography. 6 TGT (Science) - Botany, Zoology and Chemistry. Pass in the Central Teacher Eligibility Test (CTET) Paper-II, conducted by CBSE in accordance with the Guidelines framed by the NCTE for the purpose. The candidate must have competency to teach both through English and Hindi. Bring all the original documents & Xerox copy of the same for verification along with the application form filled by the candidate. Candidates with higher qualification and experience will be preferred. Download the application form from the Kendriya Vidyalaya Website and submit during registration. No TA/DA will be paid for appearing interview. Payment, duties and responsibilities of contractual teachers as per the instruction available at KVS website.